Welcome to Part 6 of "DC Direct schools Mattel," a continuing comparison of the ways in which even a company new to the world of toys can outpace the industry's old guard by making good decisions. In their first two series of "Hush" figures, DC Direct gave us figures of Batman and Nightwing. With the first two spots in the Batline-of-succession filled, who would they put in Series 3? Not Robin - though he showed up in the story, DCD just released a figure of him in their Teen Titans line. Not Azrael, because Jeph Loeb didn't bother with him. Where do they go from there? Turns out they go right into variant land. When the Dark Knight takes to the skies high above Gotham, he dons this special protective suit! When, during his search to discover who had been manipulating his life, Batman turned up clues that pointed toward Ra's al Ghul, he needed to get the madman's attention. His solution was very direct: since he didn't know precisely where al Ghul was at the time, he went to the one person who might: the demon's daughter, Talia. What followed was one of the greatest action scenes ever put forth in comics, an interlude to the story that would put most James Bond opening sequences to shame. And when he did it, he wore a new costume. Jim Lee probably felt more at home drawing this outfit than Batman's regular duds: after all, this plays to his typical design sensibilities of lots of straps and pouches. Batman's wearing modified HALO gear, but the design of it still looks perfectly like one of his costumes. The body of the suit is padded, making Bruce look more like his bulky Dark Knight Returns incarnation, but it's really insulation to keep the wearer warm and awake at high altitudes. The suit is gray, with vertical vanes running its length. Above that is a lighter gray harness. All the straps are painted silver and detailed nicely. There are a few yellow tubes on his chest, probably secondary oxygen supplies. His utility belt is the same light gray as the rest of the harness, working a classic bit of bat-paraphenalia into a real world situation. Look under his cape and you'll find four silver canisters and a five-pocket satchel that rests in the small of his back. It's in the wrong place to be a parachute, but maybe that's intentional - Bruce uses a 'chute shaped like his bat symbol, so maybe it needs to be deployed differently? 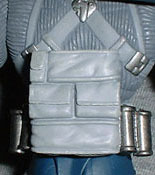 There's a removable pack in the center of his chest, with respirator tubes that run up to his mouthpiece. The pack has oxygen supplies, an altimeter and a few brightly colored buttons. The mouthpiece doesn't actually connect to the figure's face in any way, it just rests against it. 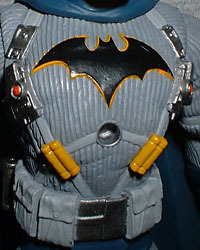 The bat symbol on his chest is raised off the surface of the figure, and has a slight yellow rim around it. The suit is accented with blue, of course: cape and cowl, gloves, trunks, knee pads and boots. The boots look sturdy and inflexible, to protect his ankles on landing. The gloves don't have the usual pointy winglets on the side, but the three giant straps that hold the gloves in place suggest a similar shape. There's a line running around the sides of the cowl and down the back, probably indicating that bit of the suit is intended to protect his ears from the severe pressure changes inherent in a HALO jump. The figure moves at the knees, hips, shoulders, elbows, wrists and neck. 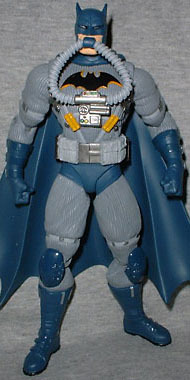 No waist, of course, even though the utility belt would have hidden any problems with it. His head is balljointed, which is why it's even better that his respirator doesn't plug in place. By having joints at both wrists, he's already one point of articulation ahead of Series 1's Batman. So now that you've read all this way down the review, you're probably wondering what this figure has to do with Mattel. Look at it this way. This is, more or less, the first figure variation DC Direct has ever done - more than six years after their founding. And instead of Electric Neon Jump Wingstrike Batman, they made something actually based on the comic in question. They didn't invent a new suit and then ask Jim Lee to include it (like Hasbro always did with their Superman animated line), it was something he came up with that they adapted. And taking this variation one step further than your typical mass market figure is the paint scheme. DC painted him blue and grey, just like the first figure - from a distance, at a glance, you might be able to confuse the two. Even if Mattel had made this figure, it would have been bright green on orange, or some other eye-gougingly bad combo. So DC Direct finally resorts to making a variation figure in a line, but it's based in reality and looks cool, too? That's why DC has once again schooled Mattel. What's your favorite Batsuit? Tell us on our message board, The Loafing Lounge.